R18A4 ALL Manual Transmission Only. R18Z1 ALL Manual Transmission Only. 2016 - 2016 CIVIC ALL ALL ALL ALL K20C2 ALL Manual Transmission Only. Bad news: it’s true. Honda intentionally makes their rubber shifter cable bushings very compliant in an effort to give the car a more tame feel. For many drivers, that’s ideal. Unfortunately, this disconnects the driver from feeling the transmission during shifts, often leading to mishsifts or slow shifting in racing conditions. 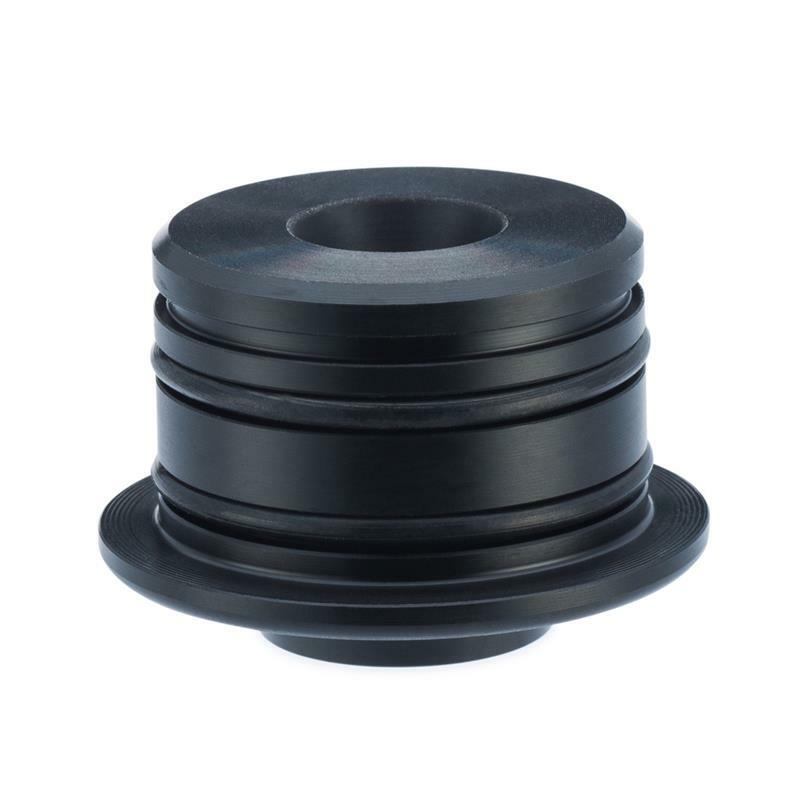 A less compliant plastic or metal bushing is the ideal solution, but without a spherical bearing, the bushing will cause the cables to bind and fatigue. That’s why ACUITY has designed this kit with a custom acetal and aluminum spherical bushing. 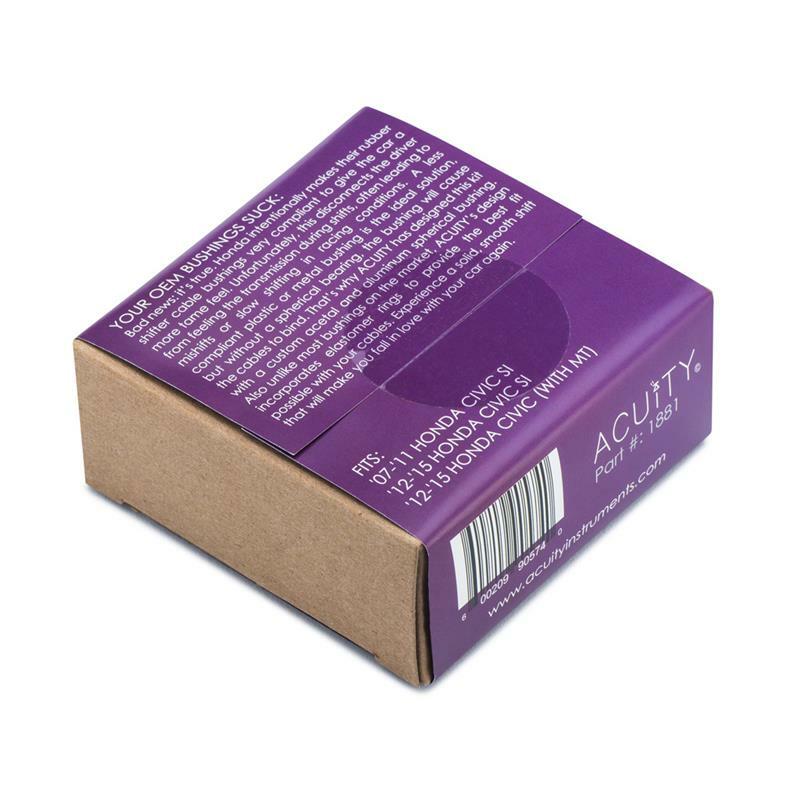 Also unlike most bushings on the market, ACUITY’s design incorporates elastomer rings to provide the best fit possible with your calbes. Experience a solid, smooth shift that will make you fall in love with your car again. Years of experience have taught the engineers at ACUITY that there are many elements to a refined, responsive shift. Compliance from flimsy components in the shift linkage leave the driver feeling detached from the transmission. 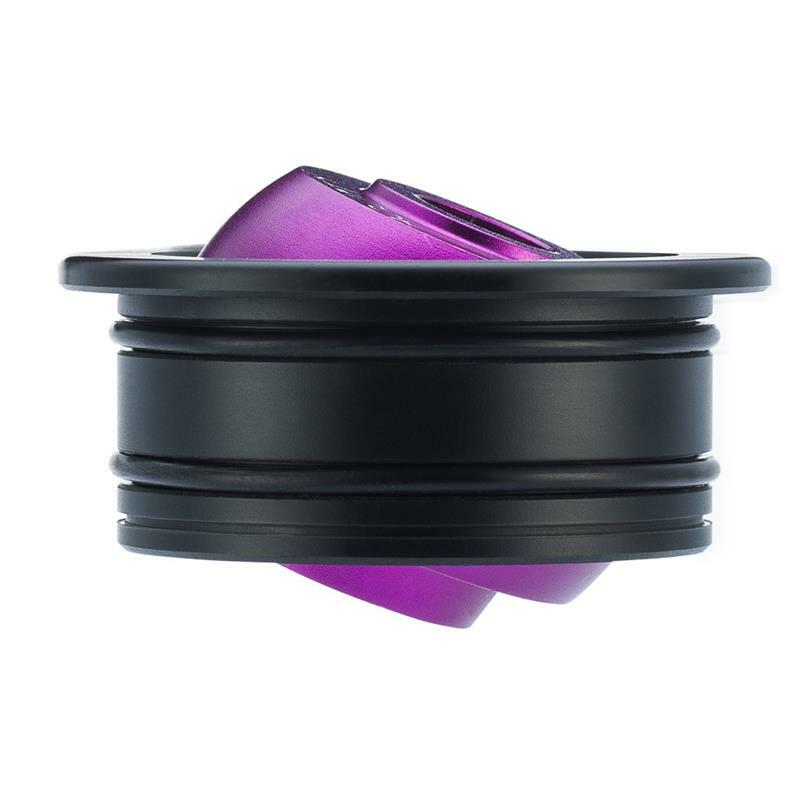 ACUITY combats this by replacing the OEM rubber bushings with much stiffer Acetal and 6061-T6 Aluminum. 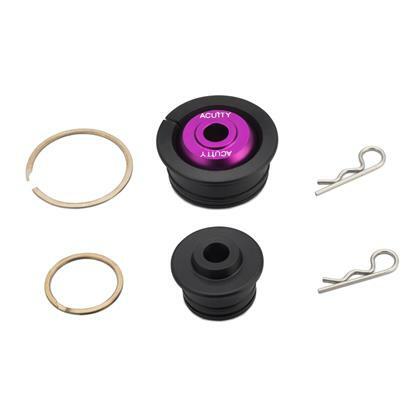 A large-diameter, custom spherical bearing minimizes long-term wear and tear while eliminating the binding that is caused by most aftermarket solid shifter cable bushings. Loose fitting components also contribute to a poor shifting feel. That’s why ACUITY uses integral o-rings on the outside of each bushing to provide a perfect fit with your OEM cables. 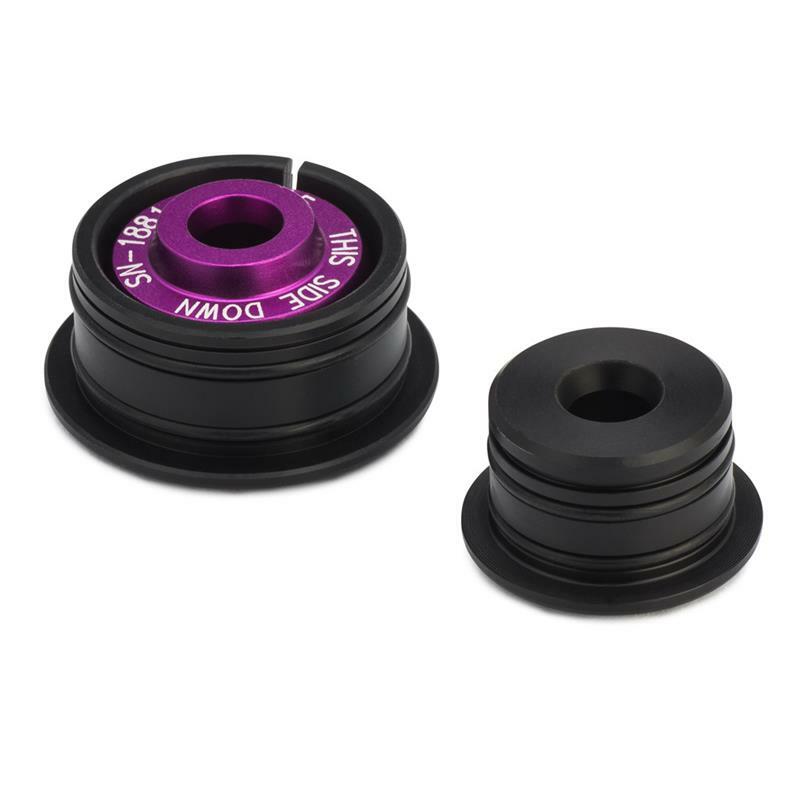 Tested on street cars, track cars, and ACUITY’s unreasonably violent shifter testing machine, these bushings are designed to be robust and proven to last. Each bushing kit is laser etched with a unique serial number and includes stainless steel hardware to help prevent long-term corrosion, keeping your bushings looking great even longer. And if all of that isn’t impressive enough, the bushings are over 20% lighter than their OEM counterparts, weighing in at only 48 grams (with hardware).